Having seen the station's booking hall and concourse, we now headed for the platform area. At the Working Platform (so named because trains can still be brought onto the platform when needed, sometimes also referred as platform A), it was surprising to see a train standing there! Apparently partly there for storage awaiting scrapping and partly available for filming. More often or not this train is kept further down the tunnel. It looked rather lonely sitting there by itself (sounds like I've been watching too much Thomas The Tank Engine!!). Not taken during the tour (the power is on), but looking equally as morose! The first part of the platform was painted and decorated - but only for filming. These weren't even the posters left there in 1994 but were updated to reflect the period necessary for the last filming project. Through the train, a roundel could be seen displaying the name of another station - again for filming. The walls were very dirty and grimy but again this was an effect added by a film company that had used the station to simulate a rescue during a train crash. Further down the tunnel, some discarded 16mm film stock was found lying on the platform. The Working Platform without the train in residence. The white fluff on the tracks are actually feathers... lots of them! These were left over from the filming of Everlast's Black Jesus video in late 2000. 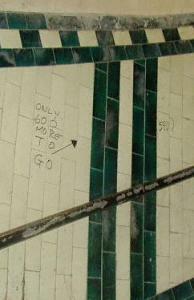 Note the original STRAND station name fired onto the tiles. Although this looks like it's fading - the distressed look is actually caused by painting to cover it up for filming at some point. It must have felt very safe down here during the Second World War. 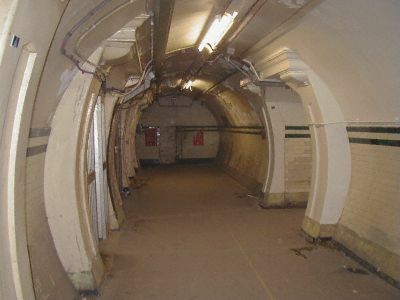 Initially discouraged by London Transport, many stations on the network were used as air raid shelters by the population of London. The platform we were standing on had become home to many people in the War, and Aldwych was actually closed for the majority of the war and used for just this purpose. Aldwych's platforms and concourse tunnels became second home to many Londoners of all classes and ages during the war, sheltering each night from the destruction and devastation above. People would emerge the next day wondering if their homes had been destroyed over night. 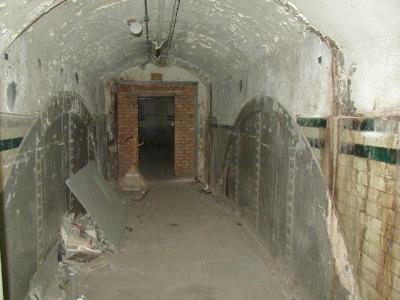 After this platform, we then went back up the corridor and entered a side passage which would have been barricaded by a locked door during the station's operational life and which was our entrance to the truly disused part of the station. 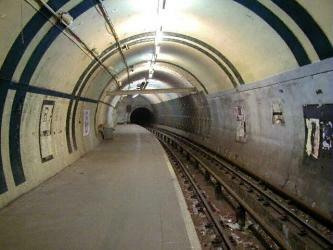 Opened in 1907, Aldwych was used much less than expected and as a result the second platform was closed in 1917. Side passage to the Disused Platform - note there are no lights here at all! Down on the very dimly lit platform itself, several experimental posters form the '70s and some more lighting schemes could be seen around the platform entrance. 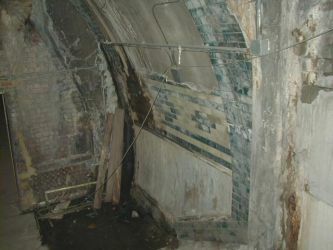 Some of the original tiling could clearly be seen along with the station's original name Strand, which was changed to Aldwych soon after opening. Surprisingly there was still track along about half the platform. 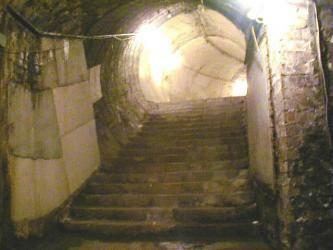 This was the oldest surviving track on the whole Underground network and we were invited to jump down and examine it. There was no suicide pit (its official name is an anti suicide pit, a trench between the two running rails that runs the length of a modern platform) since these only began to appear later and the "live" rails still had the original square insulation blocks. There was no chance of electrocution however as this stretch was separated from modern tracks by about 500 yards of trackless tunnel! As an aside, it was a very surreal experience actually jumping down onto the track. My brain was telling me that there's something inherently wrong about doing that - it took a little psychological convincing that it was OK to do that here! Down at the other end of the platform, a stretch of about 5 metres in length had been decorated to look like modern day Holborn. This time, not a film set but more prototyping. Down here it was really dark as none of the lighting was on but we were soon to enter an even darker passageway - the original running tunnel for this platform. Two views of the Disused Platform - note the old original rails with no suicide pit and square insulators instead of the modern round ones. 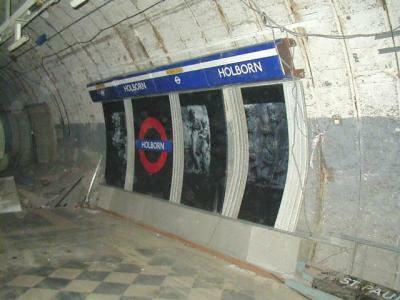 Then, the Holborn mockup at the end of the platform. As we walked down the steel ribbed tunnel, it felt like being in one of those pictures of Jonah in the Belly of the Whale I remember from Sunday School days! It was an eerie feeling since not only was the only lighting provided by our wildly swinging torches but also there was a ghostly echo coming down the tunnel ahead of us not only of our own voices but also occasionally the rumbling of a train running through Holborn station could occasionally be heard distorted strangely by the tunnel's ringed walls and length. Above us we could see several stalactites, where water had leaked through the metal shield and had for years been dripping into the tunnel. We were soon to discover where this water went. About 100m into the tunnel, we stopped at a small wooden trapdoor, which our guides opened, underneath which was the scummiest looking water I've ever seen, which it was demonstrated was about 2 feet deep. Far worse than the water seen draining out of my central heating pipes and much more diseased looking than a 6 week old cup of coffee! 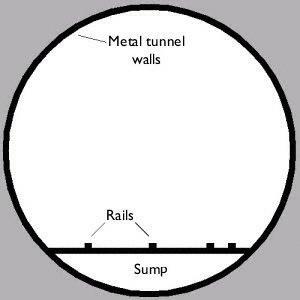 Apparently under the running track of each tunnel runs a sump where water gathers. 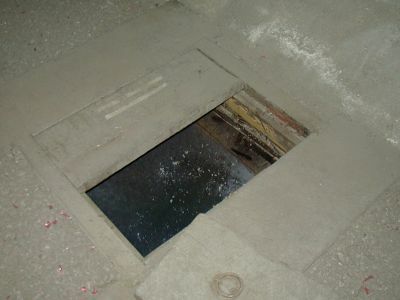 In some places this sump needs regular draining otherwise the tunnels would flood. A unique breed of mosquito apparently thrives in these waters. There are 782 water pumps around the Underground network at 325 different locations - over 14 million litres are pumped out each day!! On the floor of this tunnel we could see many fragments of purple glitter - this was used in a pop video a couple of years previously where thousands of these were blown by a large fan down the tunnel for a special effect shot. 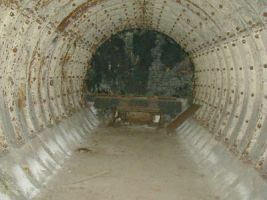 In fact, if we had continued walking down this tunnel we would eventually have ended up on the disused platforms I visited in February 2000 at Holborn. The sump water... and some purple glitter! Before finishing the tour, we walked all the way down to the other side of the disused platform, passed the entrance we came through and into a section that was so run down that it was obvious that it had never been completed. 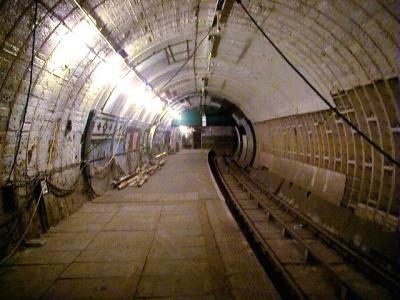 This was originally intended to be a second exit to the lift area and also to be a tunnel to join the two platforms but was never even decorated due to cutbacks. 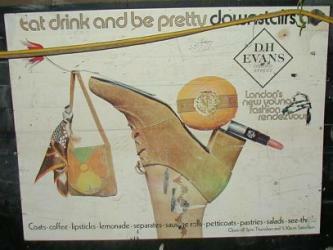 We had to be careful here since the stairs seemed to be in such bad condition that they were crumbling away in places. The exit to this passageway was a steel door right next to the spiral staircase. Looking up - and then down the derelict staircase leading to the Disused Platform. 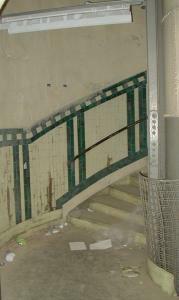 Just to the right of this staircase, the running tunnel continued for another 38 metres before finally ending in a set of buffers, left over from when the line was in use before 1917. The end of the line. Should the Aldwych branch ever be extended south of the Thames, this is where work would begin - or end! Did I say only 119 steps at the beginning? 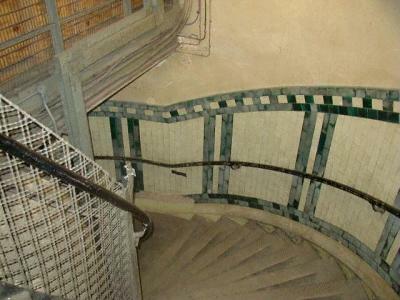 Phew - it was quite exhausting walking back up these stairs but well worth the climb after the chance to see the station. I can't praise the London's Transport Museum guides enough for leading this visit - they were exceptional in their professionalism and expert knowledge of the station and Underground history in general. There's so much I've had to leave out of this description. Thank you London's Transport Museum for this wonderful opportunity. For the time being, no further periodic tours of Disused Stations are being arranged by London's Transport Museum. 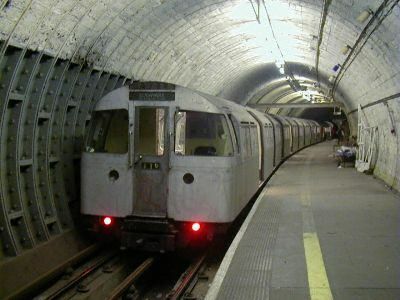 Instead, in recent years, London Transport Museum and London Transport For London have had open weeks at Aldwych where many hundreds get the opportunity to visit. In the past these have been themed, such as a "Blitz experience" complete with special effects, old period train on the platform and actors to bring atmosphere to the visit. These are usually sold out very quickly. More photographs taken during a visit in April 2001 during some filming at Aldwych can be seen on the Scrap Book. Several people have written and told me they liked the photos but found it difficult to imagine where they were taken with regard to the station layout. Well, after a visit with sketch book in hand, I drew this rough outline of the station's layout. Click on the little arrows to see the photograph taken from that location displayed immediately beneath the map. Written April 18th 2000, with a couple of paragraphs added April 2001. NOTE: None of these photographs were taken during the LT Museum tour described on this page and there were several differences between what I saw on the tour and what appears in the photographs. 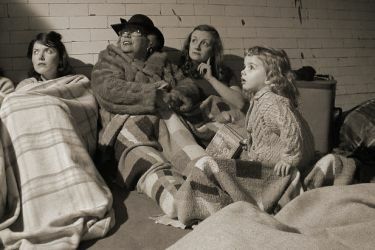 The sepia "World War 2" photograph was actually taken during the filming of a scene depicting Aldwych being used as an Air Raid shelter on 3rd April 2001 when I was invited by Jay Hunt, the director to observe filming at Aldwych. The people in the photograph are his family! Thanks Jay - it was a great experience!